‘Holos’ meaning whole in Ancient Greek, celebrates the union of two individuals into a whole. The symmetrical four points and central Emerald at its heart reflects complete contentment and balance. Shown in Platinum, with a centre Diamond of 0.65ct, Emerald Cut. The Holos Engagement Ring fits perfectly inside the Harmonia Wedding Bands. or 6 payments of $1,842 with What's this? 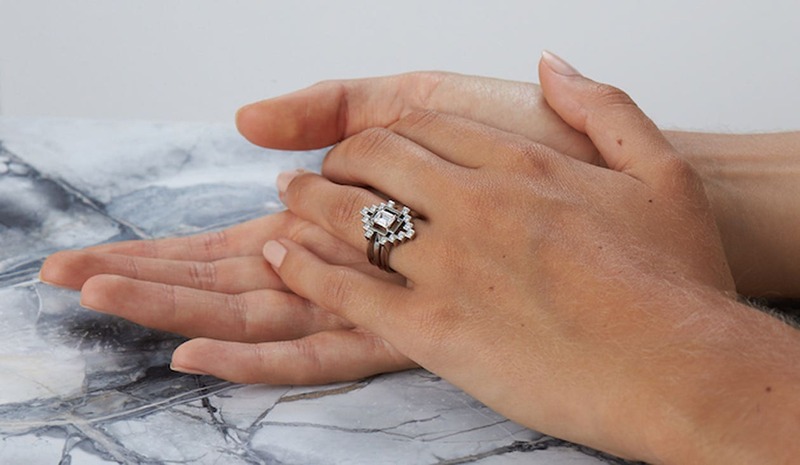 The Holos Ring is inspired from the ancient philosopher Plato, who believed that the gods originally created humans as 1 unity but later split them in half fearing their power. The symmetrical four points and central Emerald shape at its heart reflects complete contentment and balance. We can alter this design to suit you, choose from Platinum, Yellow, White or Rose Gold, or change the central stone to a Emerald, Sapphire or something unique. We like nothing better than working with you to create something truly special. “Zoe & Morgan took the key elements of the coat of arms and made something that looks so amazingly cool and contemporary. A year on, we both still love our rings just as much, if not more than on the day we married."